“Rue” redirects here. For other uses, see Rue (disambiguation). Ruta graveolens [L. strong smelling rue], commonly known as rue, common rue or herb-of-grace, is a species of Ruta grown as an ornamental plant and herb. It is native to the Balkan Peninsula. It is now grown throughout the world in gardens, especially for its bluish leaves, and sometimes for its tolerance of hot and dry soil conditions. It is also cultivated as a medicinal herb, as a condiment, and to a lesser extent as an insect repellent. In the ancient Roman world, the naturalists Pedanius Dioscorides and Pliny the Elder recommended that rue be combined with the poisonous shrub Oleander to be drunk as an antidote to poisonous snake bites. Nature: Warm and dry in the third degree. Optimum: That which is grown near a fig tree. Usefulness: It sharpens the eyesight and dissipates flatulence. Dangers: It augments the sperm and dampens the desire for coitus. Neutralization of the Dangers: With foods that multiply the sperm. The refined oil of rue is an emmenagogue and was cited by the Roman historian Pliny the Elder and the gynecologist Soranus as a potent abortifacient (inducing abortion). Rue has a culinary use, but since it is bitter and gastric discomfort may be experienced by some individuals, it is used sparingly. Although used more extensively in former times, it is not a herb that is typically found in modern cuisine. Today it is largely unknown to the general public and most chefs, and unavailable in grocery stores. It is a component of berbere, the characteristic Ethiopian spice mixture, and as such is encountered in Ethiopian cuisine. Also in Ethiopia, fresh rue is dipped in coffee before drinking it. It was used extensively in ancient Near Eastern and Roman cuisine (according to Ibn Sayyar al-Warraq and Apicius). Rue is used as a traditional flavouring in Greece and other Mediterranean countries. In Istria (a region in Croatia), and in Northern Italy, it is used to give a special flavour to grappa/raki and most of the time a little branch of the plant can be found in the bottle. This is called grappa alla ruta. Seeds can be used for porridge. In Italy in Friuli Venezia-Giulia, the young branches of the plant are dipped in a batter, deep-fried in oil, and consumed with salt or sugar. They are also used on their own to aromatise a specific type of omelette. Used in Old World beers as flavouring ingredient. Rue is also grown as an ornamental plant, both as a low hedge and so the leaves can be used in nosegays. Most cats dislike the smell of it, and it can, therefore, be used as a deterrent to them (see also Plectranthus caninus). Caterpillars of some subspecies of the butterfly Papilio machaon feed on rue, as well as other plants. The caterpillars of Papilio xuthus also feed readily on it. In South India, rue is recommended for home gardens to repel snakes (however the effectiveness is unknown). Rue extracts are mutagenic and hepatotoxic. Large doses can cause violent gastric pain, vomiting, systemic complications, and death. Exposure to common rue, or herbal preparations derived from it, can cause severe phytophotodermatitis which results in burn-like blisters on the skin. A series of furanoacridones and two acridone alkaloids (arborinine and evoxanthine) have been isolated from R. graveolens. It also contains coumarins and limonoids. Cell cultures produce the coumarins umbelliferone, scopoletin, psoralen, xanthotoxin, isopimpinellin, rutamarin and rutacultin, and the alkaloids skimmianine, kokusaginine, 6-methoxydictamnine and edulinine. The ethyl acetate extract of R. graveolens leaves yields two furanocoumarins, one quinoline alkaloid and four quinolone alkaloids. The chloroform extracts of the root, stem and leaf shows the isolation of the furanocoumarin chalepensin. The essential oil of R. graveolens contains two main constituents, undecan-2-one (46.8%) and nonan-2-one (18.8%). 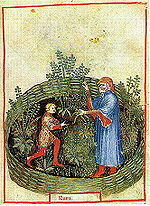 The bitter taste of its leaves led to rue being associated with the (etymologically unrelated) verb rue “to regret”. Rue is used by Gulliver in “Gulliver’s Travels” (by Jonathan Swift) when he returns to England after living among the “Houyhnhnms“. Gulliver can no longer stand the smell of the English Yahoos (people), so he stuffs rue or tobacco in his nose to block out the smell. “I was at last bold enough to walk the street in his (Don Pedro’s) company, but kept my nose well with rue, or sometimes with tobacco”. Rue is mentioned in the Bible, Luke 11.42: “But woe unto you, Pharisees! For ye tithe mint and rue and all manner of herbs”. In mythology, the basilisk, whose breath could cause plants to wilt and stones to crack, had no effect on rue. Weasels who were bitten by the basilisk would retreat and eat rue in order to recover and return to fight. Rue is considered a national herb of Lithuania and it is the most frequently referred herb in Lithuanian folk songs, as an attribute of young girls, associated with virginity and maidenhood. It was common in traditional Lithuanian weddings for only virgins to wear a rue (ruta) at their wedding, a symbol to show their purity. Likewise, rue is prominent in the Ukrainian folklore, songs and culture. In the Ukrainian folk song “Oi poli ruta, ruta” (O, rue, rue in the field), the girl regrets losing her virginity, reproaching the lover for “breaking the green hazel tree”. “Una Matica de Ruda” is a traditional Sephardic wedding song. “Chervona Ruta” (Червона Рута—”Red Rue”)—a song, written by Volodymyr Ivasyuk, a popular Ukrainian poet and composer. Pop singer Sofia Rotaru performed the song in 1971. More recently Rotaru performed in a rap arrangement. ^ Pliny the Elder. Natural History Book. p. Book 24, 90. ^ Pedanius Dioscorides. De Materia Medica. p. Book V, 42. ^ a b c “Rue”. drugs.com. 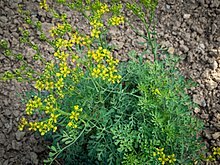 ^ “Rue (Ruta graveolens L.)”. ^ Ghirardini, Maria; Carli, Marco; Del Vecchio, Nicola; Rovati, Ariele; Cova, Ottavia; Valigi, Francesco; Agnetti, Gaia; MacConi, Martina; Adamo, Daniela; et al. (2007). “The importance of a taste. A comparative study on wild food plant consumption in twenty-one local communities in Italy”. Journal of Ethnobiology and Ethnomedicine. 3: 22. doi:10.1186/1746-4269-3-22. PMC 1877798. PMID 17480214. ^ Spencer Hornsey, Ian (December 2003). “Chapter 3”. A History of Beer and Brewing. Royal Society of Chemistry. p. 103. ISBN 978-0-854-04630-0. ^ Dempster, J.P. (1995). “The ecology and conservation of Papilio machaon in Britain”. In Pullin, Andrew S. (ed.). Ecology and Conservation of Butterflies (1st ed.). London: Chapman & Hall. pp. 137–149. ISBN 0412569701. ^ Arias-Santiago, SA; Fernández-Pugnaire, MA; Almazán-Fernández, FM; Serrano-Falcón, C; Serrano-Ortega, S (2009). “Phytophotodermatitis due to Ruta graveolens prescribed for fibromyalgia”. Rheumatology (Oxford, England). 48 (11): 1401. doi:10.1093/rheumatology/kep234. PMID 19671699. ^ Furniss, D; Adams, T (2007). “Herb of grace: An unusual cause of phytophotodermatitis mimicking burn injury”. Journal of Burn Care & Research. 28 (5): 767–769. doi:10.1097/BCR.0B013E318148CB82. PMID 17667834. ^ Eickhorst, K; Deleo, V; Csaposs, J (2007). “Rue the herb: Ruta graveolens–associated phytophototoxicity”. Dermatitis. 18 (1): 52–55. doi:10.2310/6620.2007.06033. PMID 17303046. ^ Wessner, D; Hofmann, H; Ring, J (1999). “Phytophotodermatitis due to Ruta graveolens applied as protection against evil spells”. Contact dermatitis. 41 (4): 232. doi:10.1111/j.1600-0536.1999.tb06145.x. PMID 10515113. ^ Steck, Warren; Bailey, B.K. ; Shyluk, J.P.; Gamborg, O.L. (1971). “Coumarins and alkaloids from cell cultures of Ruta graveolens”. Phytochemistry. 10: 191–194. doi:10.1016/S0031-9422(00)90269-3. ^ Oliva, Anna; Meepagala, Kumudini M.; Wedge, David E.; Harries, Dewayne; Hale, Amber L.; Aliotta, Giovanni; Duke, Stephen O. (2003). “Natural Fungicides from Ruta graveolens L. Leaves, Including a New Quinolone Alkaloid”. Journal of Agricultural and Food Chemistry. 51 (4): 890–896. doi:10.1021/jf0259361. PMID 12568545. ^ Zobel, Alicja M.; Brown, Stewart A. (1988). “Determination of Furanocoumarins on the Leaf Surface of Ruta graveolens with an Improved Extraction Technique”. Journal of Natural Products. 51 (5): 941–946. doi:10.1021/np50059a021. PMID 21401190. ^ Kong, Y.; Lau, C.; Wat, K.; Ng, K.; But, P.; Cheng, K.; Waterman, P. (2007). “Antifertility Principle of Ruta graveolens”. Planta Medica. 55 (2): 176–8. doi:10.1055/s-2006-961917. PMID 2748734. ^ Walsh, William Shepard; Garrison, William H.; Harris, Samuel R. (5 January 1888). “American Notes and Queries”. Westminister Publishing Company – via Google Books.